You have $7 000 in your budget for your trip. You are headed to Vegas from Friday night to the following Friday. Friday night you hit the casinos hard and spend $2500 dollars. YOU ARE NOW NOW AT $500 FOR THE NEXT 5 DAYS………. You try to cheap it out for the following two days but end up down to $100 left for Wednesday, Thursday and Friday. You have no recourse but to get a line of credit for the remainder of the trip, spending another $2000 before coming home. When you look at calories as currency, you may have 14 000 calories allotted for the week. On Saturday, you consumed an additional 5000 calories, including popcorn at the movies, the all you can eat buffet restaurant and then Dairy Queen to finish off the night. I see this scenario all the time. 5 days of starvation, cutting from the usual 2000 calories to 1200 calories, dying for the weekend to come, and to make matters worse, with your will weak from starvation and lack of structure over the weekend, plus all of the temptations around you….. YOU NATURALLY CAVE ….and Cheat on your plan. Amazingly, we don’t respect our finances the way we should. The average Canadian family spends 137% of what they make. What’s worse is we are even more brutal with food, calories and health. “I will begin next month”, only to follow the same pattern month after month, right into the palms of obesity. After chomping down a steak, mac and cheese, bread, a yam and a Caesar salad for dinner the other day on my Refuel, I left the restaurant feeling like I could repeat that exact same meal immediately, I was that hungry. Rather than succumb to my urges and get a burger from a fast food joint, I decided to hold off and wait a little. It was not 30 minutes later that I was completely full. My SATIETY site in my body finally registered that I was FULL. EAT LIKE A FOOD CRITIC. Savour each bite. Make the most over every morsel. Truly enjoy your food. Ever wonder what the best two bites of your ice cream are? It’s the first and last bites. The rest becomes automatic eating. By slowing down your eating, you are more likely to hit that satiety without overindulging. Smart move, especially once you learn to truly appreciate what you are eating. Try the “FOOD CRITIC” Strategy. Don’t just acknowledge and shrug it off. It’s the proper way to eat, anyhow, from a digestive standpoint. There’s only so much one can focus on before being spread too thin. At the same time, being solely focussed on only one thing can be equally damaging from the perspective of not living a balanced life. True success in any one area requires pretty intense focus. However, that doesn’t mean that this particular area requires 16 hrs devoted to its success. Case in point, work. I make the most of my time at work. That’s a solid 8 hrs put in. That leaves me with another 8-10 hrs to give to other important areas in my life. One of those areas is my family. I try to spend quality time with each member of my family. The final one I’m going to mention is my contribution to fitness through writing, to which I devote about an hour each day. Think of it as a 4 lane superhighway. The FAST LANE is my family. I serve them. I maintain a meaningful mentorship role for my kids. I enjoy my time with each member of the family, whether its a coffee with my wife or conversation or games with the kids. The left MIDDLE LANE is my health. It’s a fast lane. this lane still required me to go faster than the regular flow of traffic in the other lanes. The right MIDDLE LANE is my career. Students are dependent on me. I value my contribution to education and I get paid for it. I go over the speed limit with my job, offering my time coaching and mentoring. The COLLECTOR LANE is the slowest of the 4 lanes. This is my fitness writing. Sometimes I need to get off the highway for a break. This is the lane that does that. I may not write for a few days. It doesn’t mean that sometimes I don’t pick things up when required to meet personal deadlines, shifting into the next lane. Here’s my point: You can focus on more than one thing and maintain the level of intensity required to be successful. 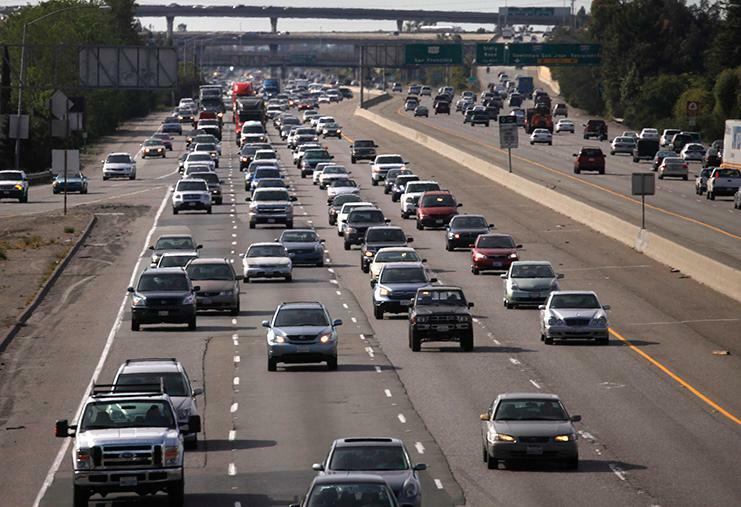 Realistically, we have a capacity of 4 lanes with which we can meet or exceed the speed limit. The rest of the stuff in our lives are for the side roads, wherever there’s time in the day. To say that you don’t have time for the 3-4 very important things in your life would be to lose perspective of your ability to manage your time to maximize your day. 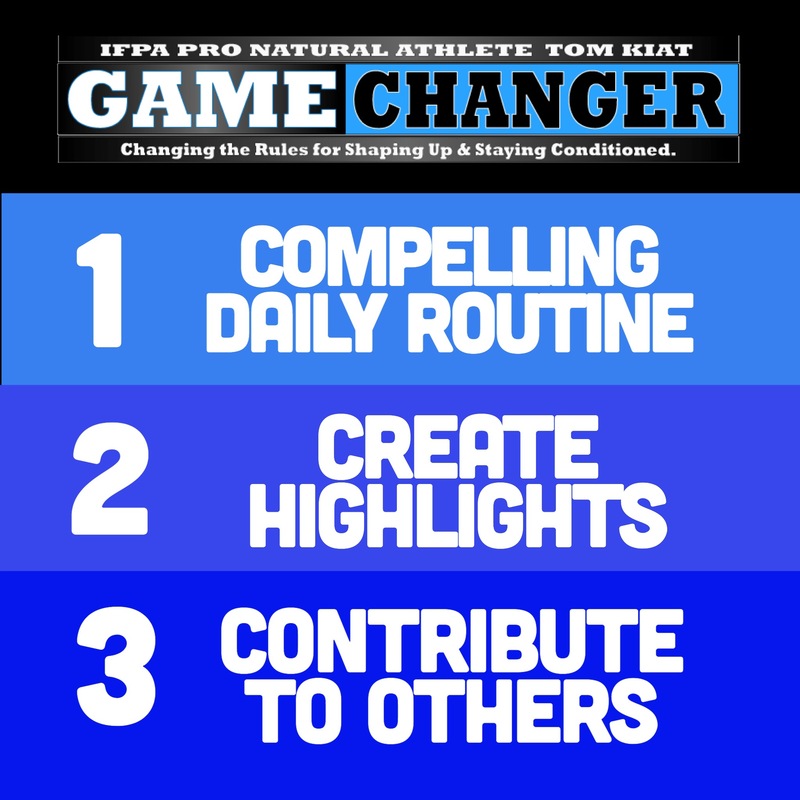 When I came up with GameChanger for my blog, my goal was to select content that would meaningfully impact your progress…. the “aha” moment type of material that would change you for the better. In his book, Tools of Titans, Tim Ferriss alludes to the fact that it’s not necessarily a specific routine that is important but rather, A ROUTINE. Your daily routine will speak volumes, and the closer you stay with a successful routine, the more success you will have in your daily life. Taken even further, the more strongly you accentuate the various aspects of your routine, heightening its significance in the day, the more powerful the routine becomes in shaping your future. What are the 7 most important things that need to be included in your routine? Outline them. Highlight them. Do Them No Matter What. All 7 are a must. Yes there may be urgent matters to attend to but these 7 items must be completed at some point during the day. WHAT DO I MEAN BY HIGHLIGHTING? How do I make each of the Daily 7 as impactful as possible, where I enjoy completing them? Strength Training: I created a routine that I truly enjoy, adding in the exercises I love that yield results, in a gym environment that suits me, with music blaring that pumps me up. I’ve stacked all the cards in my favour. That’s how you highlight the item. Cardio: I hate cardio. How do I make this a highlight? I have two workouts. The first is HIT, with battle ropes, jump squats, medicine ball slams, etc. I test myself against time. I keep the workout short. I save my favourite music tracks for this workout. The longer workouts, I do in front of a tv, playing vids that occupy my mind or I connect with those close to me, either by text or via facetime. I multi-task. Meals: The 4 meals I choose are ENJOYABLE. I love my breakfast every morning. I sit by a window with my dog beside me, coffee on one side and oatmeal with protein powder in front of me. I read something interesting as I eat. It starts my day right. For lunch, I bring something from home that I look forward to. My mid day snack, and coffee are like some eat a donut and a coffee. My dinners are always spectacular, planned the night before, as part of a rotation of things I like. Who ever said a routine had to be boring. Whether it’s a grilled steak and a potato or a grilled chicken and kale salad, or a taco salad, I look forward to a dinner with my family. Connection: Every day, I have conversations with my wife. Every day, I connect with my son numerous times throughout the day via text or facetime as he is in North Carolina. Every day, I joke around with my daughter, twice a week bringing her to volleyball. These connections, real meaningful conversations are vital. Biz Plan: Every day, I connect with everyone I work with, in some way. Secondly, I do something that provides value to them, whether it’s research or blog writing. Finally, I always seek a fun way to develop my biz with a weekly strategy that is executed daily. Positive Impact: I’ve learned that by contributing to others’ lives, I truly enrich my own. I seek opportunities to make a difference. I point out things that people do well. I genuinely reach out to people. I am an ear for anyone who needs my help. When you make yourself open and seek those opportunities, it’s magical. Recharge Time: 30 Minutes per day, I read something meaningful or relax in the hot tub or listen to music or roll out my body in the gym. Every single day, it’s my time uninterrupted. When I hit all 7, I put my head down to rest at the end of the day with zero regrets. I don’t look for escape through food or alcohol. I don’t get depressed. I lived my life fully that day with, as corny as it sounds, a meaningful Daily 7, highlighted to accentuate each of the 7. Develop a routine. Stick with it. Make each of the items on the list meaningful. Highlight each. Watch what happens as you repeat daily, weekly, monthly. Here’s my challenge to you. Over the next 3 weeks I’m going cover some strategies in each of these parts. It’s not going to be some broad generalizations that you read in some self-help, motivational book. Maybe I have a bad attitude towards that kind of stuff but I’m not into pie in the sky advice from people who seem too excitable to look you in the eyes and actually give you meaningful material without trying to sell you something. HOW DO MOST PEOPLE CELEBRATE OCCASIONS? FOOD EXCESS IS USUALLY AT THE TOP OF THE LIST. Christmas: Giant Feasts at every family you visit. Holiday Cruise or Trip: All you can eat buffets and feasting because it’s “vacation time”. Valentine’s Day: Dinner and Chocolate over intimate time. Friday Night: Pizza and beer to “escape” to the weekend. Food is quick and easy, providing tonnes of short term gratification. People often highlight each day, or try to salvage something good of it by finishing the day with an iced cappuccino or donut treat. The end result is often sadness and feelings of weakness and insecurity as the weight adds up on your body and you end up on the next diet kick or try to hide your body in the summer. That or, what you often see is someone look forward to a vacation for weeks, and shortly after the holiday they are depressed because…..then what? 1. THE DAILY. I make sure every day has a highlight to it that I can look back at, at the end of the week and say “wow” that was an awesome day. This is as simple as anxiously waiting to get home to see Episode #3 from Season 3 of “Son’s of Anarchy” on demand. My key point is that there is something in place for the day that you look forward to that excites you versus what so many people do, seeking out food as their “highlight” or escape. Other things on my “Daily” list include my Sunday night walks with my wife, Saturday refuel where we go for a special meal (as part of a discipline exercise plan), hot tub one or two times per week to cap off the night, a game of chess with my son on a Thursday night, Friday night coffee date, Tuesday night mountain biking through trails. The point is, every night has something I really look forward to that is DELIBERATELY scheduled. 2. THE WEEKLY. Every week I try to come up with 1 thing that I look forward to all week. An easy one for me is Tuesday Night Movie Night. It might mean going to the driving range with friends on a Sunday afternoon. Another on is catching UFC at a local pub on a Friday night. I choose something that I’m really looking forward to, that is not food related and involves family and/or friends. 3. THE MONTHLY. Every month, I try to plan one special day with EACH person in my family. That special day is devoted to that person. I try to make it a meaningful daylong event. This could be shopping and a tour through Niagara Falls with my wife. This could be a day at an amusement park with my daughter. GoKarting, fishing and golf all in one day makes for a spectacular day with my son. Another idea is concert tickets. This event happens every 31 days, it’s scheduled on your calendar. 5. THE YEARLY. Every year, there’s a getaway planned, a vacation of sorts. This past few years its been a Cruise, Florida, North Carolina, and this year Florida again. 6. THE 2 YEAR BIG HIGHLIGHT. This often requires saving some money to go someplace relatively special. 2 years of deliberate savings gives you 24 months to pocket some money. Iceland is on my list as is Vegas. Believe it on not, neither trip is overly expensive and with a few hundred strategically set aside monthly, this is possible. 7. THE 5 YEAR MEGA. Every 5 years, do something spectacular. There’s only so many years that you are on this earth. It would be a shame not to realize some of the dreams that you may have had. Hawaii is on my list, as was one of the best trips I ever took, going to Arizona with my son do dune buggy through the desert. Europe may be the destination. You will kick yourself, when in your 60’s when you look back and realize that you didn’t really go anywhere. You notice some of these items involve some money. To that I say, create a plan to make it happen, both with travelling on a budget, and a monthly plan with your regular expenses, cutting back where possible to make things work. Most of these options really involve deliberate planning and booking….action…to make happen. Ever since I started deliberately planning in this way, with small things interspersed with bigger events, life has become a lot more interesting. There’s always highlights to be had and to look forward versus the alternative of waiting for 12 months for the big trip and then wondering what to do afterwards, or worse yet, drowning aimlessly in food escape as a means to create a state of happiness. SECRET TO LIVING IS GIVING? Watch truly great parents. They put their kids first and would jump in front of a bullet for them? Why? These kids are their legacy. Look at any great scientist who wakes up early and stays in the lab late at night looking for a cure for a disease. This is their passion, their mission in life, their contribution. They are motivated by something greater than them. When things are all about you, most choke in unhappiness, looking for the next hedonistic activity or outlet of escape. When you shift your focus and start giving of yourself, your life takes on new meaning. My passion has always been in the area of fitness and health. I love seeing people win. I will always give of myself and contribute long after I retire from formal work. My contribution and service to others drives me. Being an example of what is possible has driven my efforts in the area of bodybuilding for years. It’s not about me, and how good I can look but rather I have used bodybuilding and my own immersion in it to demonstrate to others that you too can do great things. LOOK AT YOUR OWN LIFE. WHAT IS YOUR GIFT? SHARE IT. Tom, I don’t have any gifts to share. If that’s the case, there’s a couple of options. Look at instagram and facebook transformations. Why do people want to share their transformations? Part of it is that these people want to be recognized. Everyone desires a sense of significance in this world. you know what? That’s ok. It’s ok to want to be recognized. More importantly, I notice these same people wanting to share their stories to give back to others, to tell others that they too can do it. This is their gift. Notice when you start getting into shape, people start commenting? Some will give you the odd snide remark, but for the most part, many want to know how you did it. If you have lost fat, gained muscle tone and feel great, sustainably, you now are qualified to at least share your story as a source of inspiration for others. This is your gift. THE GIFT OF FITNESS INSPIRATION THROUGH YOUR OWN STORY IS AN EASY ONE. THIS IS SO BECAUSE 3/4 OF THE POPULATION STRUGGLES IN THIS AREA. Another option, find a cause that is meaningful. Some volunteer at a local homeless shelter. Others take in stray animals from the animal shelter. Some volunteer at the local school, helping kids with reading or coaching. FIND AN ORGANIZATION YOU CAN CONTRIBUTE TO ON A SCHEDULED PERIODIC BASIS AND GIVE OF YOURSELF. If you find something and it doesn’t jive with you, keep searching for one that is meaningful. WHAT CAN I DO TODAY TO MAKE THE DAY OF SOMEONE WHO I CROSS PATHS WITH? When you look for this opportunity deliberately, it will bring a lot of joy to your life. One time I purchased 2 coffees for the ladies behind me in the drive through. It felt great to be chased down the street because these ladies wanted to say thank you. I had a smile on my face the whole day. It was something small, but significant. This March, I’m judging a bodybuilding contest in Buffalo. This is my contribution to the sport. Offering advice and support to fellow athletes is very meaningful to me. Will it cost me money to travel to the event, and stay for the night? Of course. Do I care? No. Helping out up and coming athletes has special meaning to me. You may look at this article and nod approvingly. Great….act on the advice if you haven’t already done so. Watch things change for you in other areas of your life. This goodie two shoes advice is real and it’s powerful when you apply it with your own style.